The Elder Scrolls V: Skyrim. I’m not calling this a review because I haven’t finished the game. And I don’t intend to anytime soon (I’ve got a lot of mileage left with the game). So, at 25 hours in, I’m going to give my 2 cents. In case you’ve been out of the video game loop for awhile, the newest Elder Scrolls game, Skyrim, has come out and shaked the foundation of the RPG genre and upped the ante for all releases to come after this. It does a lot of things right but makes some rookie mistakes that some critics have been pretty vocal about. Bethesda’s latest releases included Fallout 3 and Elder Scrolls IV: Oblivion, both of which were released with a boatload of glitches and mistakes as well. So here’s the story, in case you’re just joining us. The story takes place in a part of the world called Skyrim, where nordic tribes (aka the Nords) mostly dominate and treat all other races like lesser beings. At the start of the game, you’re set to be executed and a dragon conveniently attacks the city you’re in. The catch is that dragons haven’t existed in ages. So, why are there dragons here? What’s happening? And once you realize that your fate is intertwined with the return of the dragons, the story really kicks in. It’s not a unique tale though (something crazy is happening, you’re conveniently the chosen one, who just happens to be uninformed and unprepared). When you create your character, you have a staggering amount of choice. You have about a dozen choices as for what race you choose, each which comes with unique bonuses. You can play as a Wood Elf who can command animals, or maybe one of the local Nords, who has a built-in resistance to cold attacks. I wanted to try out the magic system, so I went with a High Elf, who boasted high magic points and a unique power to regenerate magic quickly. Not as fancy as some of the other bonuses, but I was going for functionality. You don’t have to choose a specialty at first, but the game rewards you for doing certain actions. If you use a sword a lot, you’ll gain levels in one-handed fighting and eventually gain access to unique perks. I used magic a lot, so I gained levels in those skills and began to identify as a mage in the game. I specifically wanted to try out the conjuration spells and specialize in that. So, what does “conjuration” mean? It means that instead of fighting enemies on my own, I can summon elementals to fight for me. "I told you to chill out." I began the game with a basic “summon familiar” spell, which is a wolf that basically just distracts my opponents. Quickly though, I gained a “flame atronoch,” whom I named “Kilda” (like Hilda, but she was known for being ruthless). Kilda could shoot fireballs, so I would summon her on a ledge or something and she would clear a room for me. Just recently, I gained the “frost atronoch,” which is featured above. I named him Frosty (however cliche that may be). He has no ranged attacks but he’s a powerhouse up close. I’ve played other RPGs where you can summon creatures but it’s never been that effective. In Skyrim, I have dominated boss battles using these conjurations. 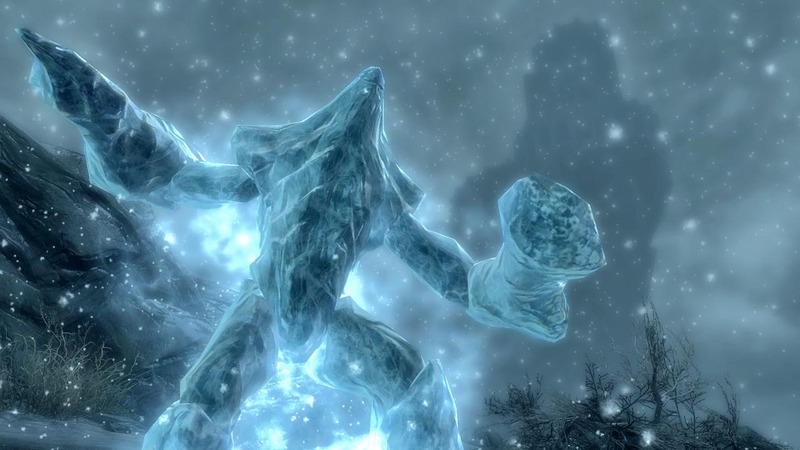 They’re extremely handy and make walking across the landscape of Skyrim a little less lonely. And what happens when I have to get into battle? Conjuration magic also features weapons that you can create on the spot. I use a giant battleaxe made of purple energy. Using it levels up my two-handed weapon skills, meaning I have a lot of perks available in that skill as well. Gameplay: The game is incredibly fun and it’s easy to pick up. There’s a “favorite” option which allows you to basically favorite any spells/weapons you use regularly, so you don’t have to always scroll through your entire inventory. You can also assigns spells/weapons to either hand (or both). I usually play with one of my conjurations on one hand and my conjured ax ready on the other. If enemies approach, a quick blast of both spells means there’s suddenly a lumbering giant of ice between me and my enemy and I’m now holding a battleaxe and ready for action. The combat is fluid and dynamic and is mixed up nicely with cinematic kill shots, making your character seem even more badass that you already thought he was. And I realized I’m using “he,” but there is definitely the option to create a female warrior as well. I’m just using my own hero as an example. Quests: At about 25 hours in, I’ve accomplished a few main story missions and quite a handful of side quests and random encounters. The quests are unique and engaging, though the fact that the game forces you to accept some of them is a bit tiresome. I walked into this one city, known for harboring the Thieve’s Guild. As a mage, I had no interest in this. But a person stopped me, talked to me, and gave me a mission to join the guild. I had no chance to say “no thanks.” Luckily, I can turn off these missions so that they’re not constantly bugging me, but it’s still a nuisance to look through my quest log and be bogged down by quests that I have no intention of finishing. And about random encounters… A majority of the game (so far) for me has been exploring. I know that I’m trying to get to point A but I have to traverse a huge mountain to get there. Between these two points, I ran into bandits, wild animals, streams full of fish, and even a dragon that I wasn’t expecting. These random encounters are extremely fun, most of the time. 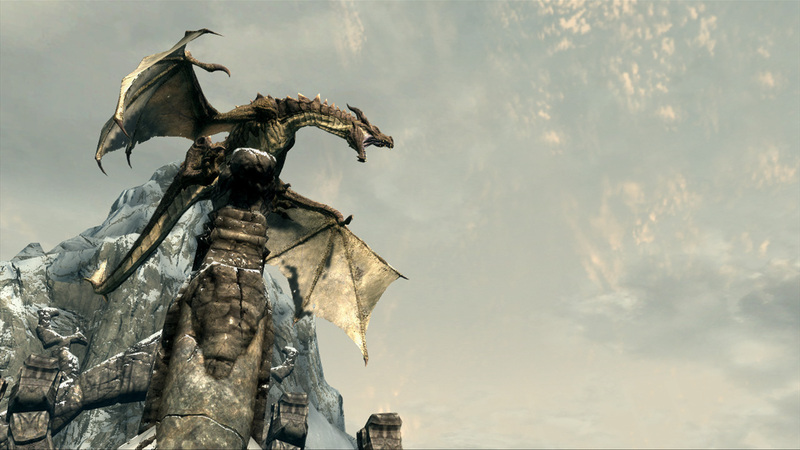 I went to a town once to sell some old gear and two dragons dropped down on top of the roofs to attack. This is incredibly immersive, as you’re forced to quickly think and act. Innocent civilians and townspeople are being charred to death, unless you stop them. Without warning, expect these fellas to drop in. Graphics: On the PS3 anyways, the graphics are pretty stellar. It’s incredible to watch snow cover the ground and run along a path with a fox cautiously following you, not sure if you’re a friend or foe. Diving off a waterfall into a giant pond and then fishing for exotic underwater plants is incredibly refreshing. Of course the PC version will hold the highest graphical standards, but the console ports still boast some of the best graphics I’ve seen. And the fact that you can go anywhere you see is a major bonus. I look up at a mountain and see a giant dragon circling it. That dragon is mine. Of course, it’ll take me an hour or so to get my way up there, but when I do… It’s on. 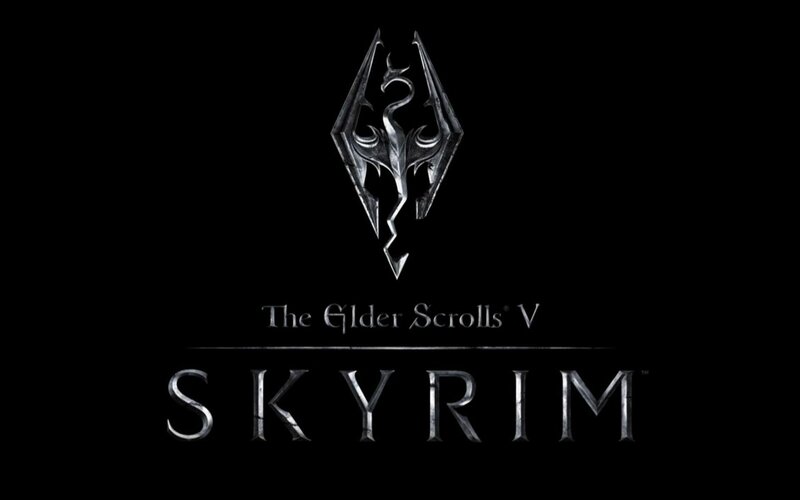 Overall impressions: Even though the story may be cliche high fantasy stuff, the world of Skyrim is the reason for this game’s success. If you don’t want to fight dragons, you don’t need to. You can spend hours just harvesting flowers and brewing potions, or maybe chopping wood and making an honest living. Of course, for those of you who want the action, it’s definitely there for you. Help rebels oust the current government. Investigate haunted ruins. Work for/against demons from other realms. There is potential for great adventure but the game will still reward you for swimming all day and finding exotic fish to sell. The occasional glitch can be annoying, such as not allowing you to continue random quests or not allowing you to loot fallen enemies. The game has only frozen on me once and it autosaves often enough to not cause too much concern. These glitches and then the inconvenience of quests you don’t intend on finishing are the only two complaints I have at this point. As I said in my opening paragraph, I don’t intend to finish this runthrough anytime soon. My conjuration is at level 50 and I have at least another 50 levels to go. And then after this runthrough, maybe I’ll try my luck with a reptile character who can breathe underwater indefinitely, and I’ll spend my days finding lost treasures. Or maybe I’ll be a sly rogue who sneaks around at night and loots every house in every city I run across, spending just as much time in jail as I do on the run from the law. Or maybe… Or maybe… This game is full of potential and a thousand quests I haven’t even discovered yet. Who else is playing? What do you think? This entry was posted in Gaming and tagged 25 hours in, conjuration, elder scrolls V, high elf, playstation 3, ps3, review, skyrim. Bookmark the permalink. My personal favorite part about the game is how weak I feel. In most games, you pretty quickly feel like you could take on anything and everything. Meanwhile, It took me an exceedingly long time to graduate from “firebolt” to “fireball” and there is a long way to go. I can win fights without too much trouble (and occasionally a bit of luck). Oh hey, a couple of bears just attacked that dragon I was having a bit of trouble with. Thanks bears… Now I’ll kill you too! Good to see that you are now DOVAKIHN!! !